Brief Synopsis: Booster Gold continues the investigation into the true identity of the Sanctuary Killer. Issue Summary: After Batman fails to convince Skeets to tell him where Booster Gold is hiding, Batgirl and Harley Quinn try a different, more violent interrogation. Meanwhile, Superman and Wonder Woman give a speech to the general public meant to calm their fears about the existence of Sanctuary. 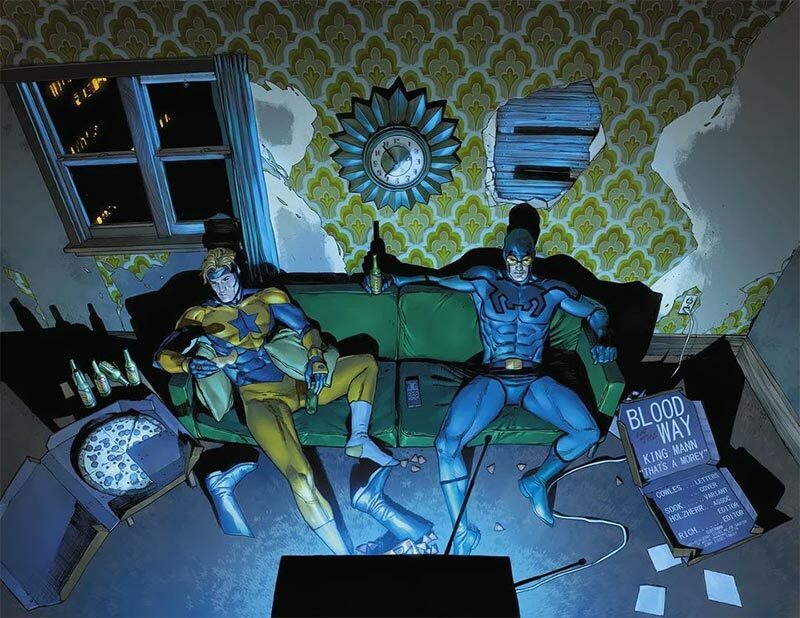 Booster Gold drinks eats pizza and drinks beer with old friend Blue Beetle. This isn't particularly integral to the plot, but it does give me an excuse to show the issue's spectacular two-page title illustration by Clay Mann. Skeets has fallen in with Batman and Batgirl, who want to know where Booster Gold is hiding. Batgirl oddly insists on calling Skeets "he." Skeets is a robot and has no gender. POWER UP: Booster Gold uses his Booster Shots to take down The Fastest Man Alive (who inexplicably stands still long enough for it to happen). Then Booster cusses, too. At least I believe that Booster Gold would cuss. MEET THE PRESS: In his nationally televised speech, Superman confirms to the public that Booster Gold is "wanted for questioning concerning the" Sanctuary killings. Booster's golden rule: the only bad press is no press. Just after using his unique knowledge of time travel, police work, and DC's super heroes to unveil the clue that may be the key to solving the Sanctuary killings — an act which finally justifies his inclusion in this murder mystery— Booster Gold is confronted by Batgirl and Harley Quinn. Boosterrific Review: It's finally clear why Booster Gold is in this series as our hero finally uses his brains to push forward a story stuck in neutral. 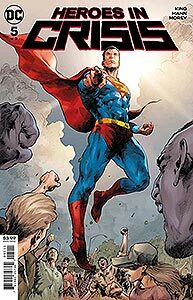 While most of this issue consists of Superman's rousing speech advocating for the support of heroes with PTSD, the real star is the beautiful art of Clay Mann.